Top seeds Jamie Murray of Britain and Swiss Martina Hingis won their second successive Grand Slam mixed doubles tennis title with a 6-1, 4-6, 10-8 victory over Michael Venus of New Zealand and Chinese Taipei’s Chan Hao-Ching in the final. Murray and Hingis had already won Wimbledon in July while Saturday’s triumph took their record as a team to a perfect 10-0, reports Xinhua news agency. “With the super tie-breaker, we know how to play the opponents,” said Hingis, who was celebrating the 20th anniversary of her singles win in New York as a 16-year-old. “We had a great first set, second, we let go a little bit, but in the super tie-breaker, I know we can still lift it up and play great tennis,” she added. 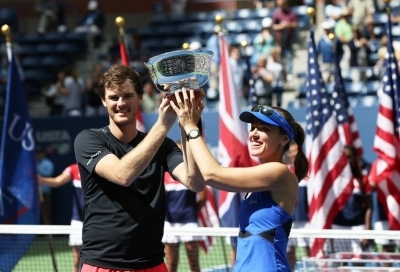 Hingis and Murray said they are ready to play the Australian Open together next year. “It’s a great opportunity for me to compete with Martina. She’s such a great player, a huge champion of the game,” he said.